Morita’s new and completely unique 3D Reuleaux Full Arch FOV abandons the typical cylinder with a new convex triangle shape. By more closely matching the natural dental arch form, this groundbreaking FOV reduces dosage by excluding areas outside the region of interest and allows a complete scan of the maxilla and/or the mandible. 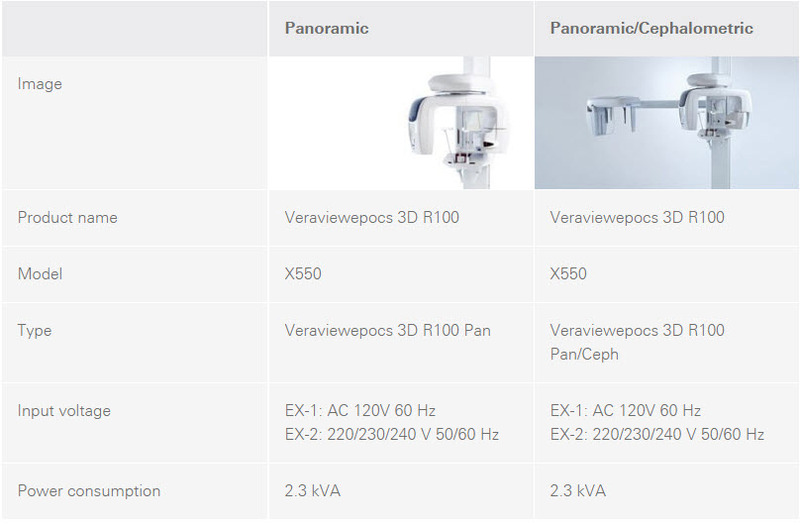 The Veraviewepocs 3D R100 model offers a total of 8 fields of view from Ø 40 x 40 mm up to Ø R 100 x 80 mm for various diagnostic needs. The new full arch scan captures the maxilla and/or the mandible with the equivalent of 100 mm in diameter and two height options of 50 or 80 mm. Its full arch capability, reduced dosage and exceptional clarity are ideal features for implant planning and oral surgery. This unit also offers small and medium field of view sizes suitable for endodontics, periodontics, as well as general dentistry. Through advanced engineering, a Dose Reduction Mode optimizes the intensity of the X-rays which lowers exposure for easily penetrated tissues. Up to 40 % of dosage is reduced compared to the standard mode (for Ø 40 X H 80 mm exposures). By maximizing efficiency, soft tissue, such as the maxillary sinus membrane and skin, appear sharper than ever before with fewer artifacts (Compared to standard exposure mode). Veraviewepocs offers high resolution images. It provides clear images of the periodontal pocket, the periodontal ligament, and the alveolar bone. It is extremely useful for implant therapy from planning to post-operative observation. With a radiation exposure time of 7.4 seconds for panoramic and just 9.4 seconds for 3D images, the patient is only subjected to X-ray radiation for a brief period. Veraviewepocs offers flexibility in positioning methods. The region of interest can be positioned by the panoramic image, the 2-directional scout, or the positioning laser beams. After initial positioning is accomplished by the 3 positioning laser beams, 2-directional X-ray images can be taken to confirm that the position is accurate. If it is not, simply adjust the position of the image on the computer by placing the cursor at the center of the region of interest. Positioning laser beams set the patient’s position and align the region of interest. 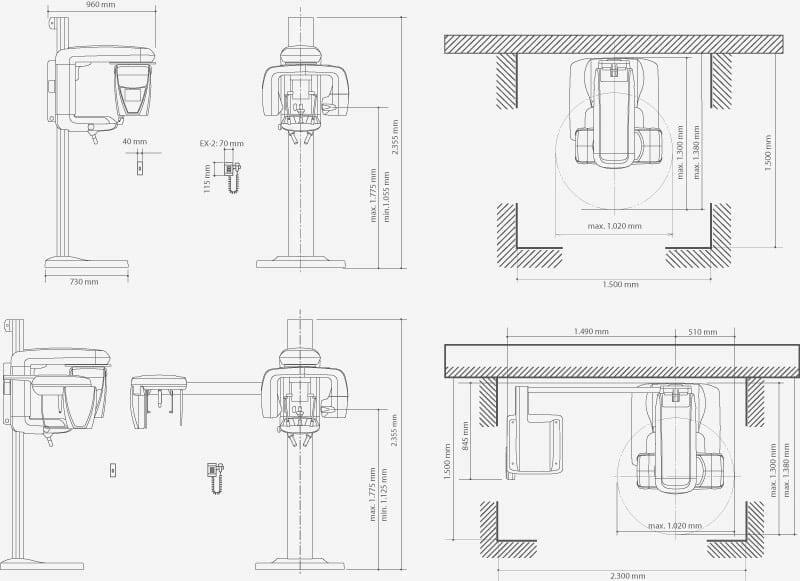 The C-arm will automatically move to the right position. Successful placement of implants starts with the very critical and detailed planning process. Identifi cation of structures such as the sinus cavity, inferior alveolar nerve and clear views of the bone structure are needed. Veraviewepocs 3D R100 is ideal for implant planning with full arch imaging, industry leading clarity, and low dosage to the patient. This software from Morita offers advanced implant planning features, plus compatibility with popular third party software. With this software you can highlight the mandibular canal for easier viewing, measuring the distance to the implant and determining its buccal and lingual position. In our database we have compiled many clinical cases for each indication. This function makes patient positioning nearly effortless. A light beam sensor automatically positions the unit without requiring the patient to move. The light beam sensor measures the distance to the patient’s teeth, then the arm automatically moves into the optimal position. This process produces images with a high degree of reproducibility. The DDAE function controls X-ray emission in real time depending on the area being examined and produces a wide dynamic range, as well as sharp and exceptionally clear images. This software processing function uses a logarithmic conversion to adjust the overall density and to highlight shaded details, creating a better image. When a full panoramic image is not required, 1 to 5 sections of the panoramic image, as well as the maxillary sinus, can be excluded to expose only those areas within the region of interest. By excluding parts of the dental arch, dose is reduced. The partial panoramic function is easy to operate. Simply press the Partial Panorama key and the panoramic and maxillary sinus appear with equally divided sections. Select any to exclude them from the irradiation area. The X-Y movement and arm rotation are coordinated by a computer control system to create a projection with the optimum image layer shape. This projection controls the angle of X-ray penetration to reduce the mandibular ramus shadow. This projection controls the angle of X-ray penetration to reduce the overlapping of individual teeth. The image layer for panoramic images can be adjusted after the exposure has been made to improve clarity and sharpness. This function makes it possible to improve the image range for areas with differing depths as well as the surface. With this function you are able to choose between single, double or three-point adjustment. The Veraviewepocs system offers high speed performance requiring only 4.9 seconds for a cephalometric scan. The speed helps ensure high quality images each and every time. With only a tenth of the dosage compared to a conventional X-ray, the exposure level is significantly reduced. For pediatric patients, the reduced scan time is especially helpful as repeat images due to patient movement are virtually eliminated. You obtain far more information about hard and soft tissue – with just a single acquisition. The variable image processing technique generates optimum grayscale values by varying scanning speeds for hard and soft tissue. With this technique, the entire exposure time is only 4.1 seconds. Without this feature, the processing time is 4.9 seconds. Imaging process can be completed within 20 seconds. You can choose between two different models: The 2D/3D imaging system or the 2D/3D and ceph system. On both models you have 3-year warranty. The person bearing responsibility for the data back-up prescribed by law shall be the operator of the unit in question. The data- base must be backed up each working day by saving to some external storage medium.